Salam & hello everyone! HAPPY INDEPENDENCE MY DEAR MALAYSIAN READERS! I am going to review the Freshkon Mosaic in Urban Grey Lens. I love Lens and looking forward to try different lens that is in the market. I got this lens from Glasses Online and will talk to you about it at the end of this post along with a special discount code! Mostly, I prefer grey or brown lenses because it is more natural and not too weird looking perhaps? And I don't like Big circle lens and avoid looking like an alien. For Comfort, I might say it does feel nice on the eye but I can still feel that I am wearing a lens. Its like "hey, I on your eye right now!". For the first 3-4 hours it was comfortable but then when it started to dry, it feel uncomfortable and I use eye drop to solve this. The Design is pretty nice,I love how it has a subtle grey lines on the edge that give a lil enlargement but still does not look like an alien. Haha. 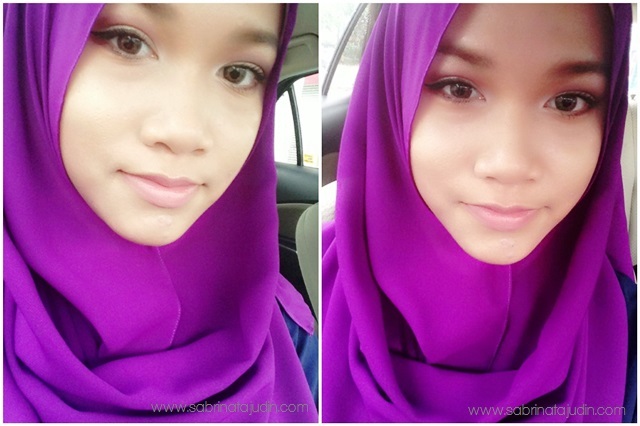 Its grayish tone color give a really natural look to my eye. For Color, it is not to bright as well not to dark where sometime it does not make any different whether you are wearing it or not wearing a lens. Its perfectly nice. The yellowish tone in this lens blends nicely on my eye and look more of a brown color when wearing it. Lastly, enlargement, if you love big circle lens, this is not for you. this is more of a natural lens look. The size of this lens is 14.2mm. Glasses Online is a Malaysia Online store for all your eyes need. They have glasses, sunglasses and my favorite part contact lens. Its pretty convenient where there are a lot of choices to choose from. I prefer buy lens online because you can read the size description easily and choose the various color offered. 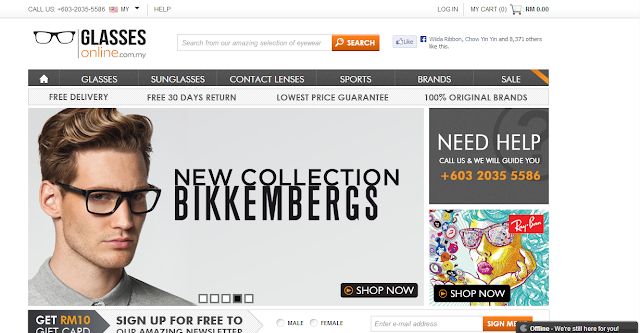 Glasses Online offer more than 50++ brands in theri website. For lens, they have most of my favorite brands in it such as FreshKon, and Blicon. I love these brands because they are more of a natural look lens than the "Japanese" big circle lens in the market. They also always have sales going on in the website offer great deals compare to the retail store out there. You can also call them and have a live chat if you have any question in mind. Payment options from credit cards, Paypal and all online banking service that is very conviniet for you. Not to mention. I love the colour, so pretty! it looks so pretty on you. i don't like freshkon btw. they're so uncomfortable. Love the contacts on you! Cantik sangat2! Hihi. And the eye makeup! alahai makin cantik mata awak lah. ngorat boleh? Looks gorgeous on you Sab! Lovely sparkling eyes! Same here, I prefer grey and brown as well and i love the color but it doesn't quite look like grey. Still, it's beautiful and suit you well. Maybe nxt time I will try freshkon too. its looks more of a yellowish grey... thanks dear! Pretty Nice post, thanks for sharing it here! I happen to stumbled upon your blog and just want to express that i truly like the way you present your blog post. I really enjoy browsing your blog. I can see that your blog post is mostly about beauty & Fashion stuff. In case you need additional beauty ideas that enhance your eyes, making them brilliantly bright and beautiful, you may want to check out www.contactlensxchange.com for more exciting brand colored circle lenses.